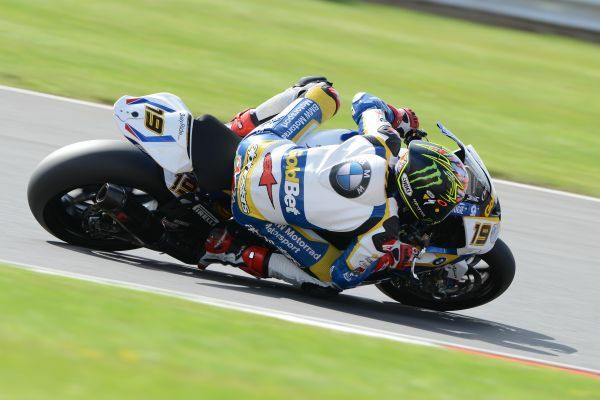 Silverstone – Qualifying Practice 2 & Superpole. BMW Motorrad GoldBet SBK Team Rider Chaz Davies #19 (GBR) riding the BMW S 1000 RR. Weather conditions: Mostly sunny with a bit of rain in the afternoon. It was a difficult Saturday for the BMW Motorrad GoldBet SBK Team at Silverstone (GBR), but it ended in a kind of a conciliatory manner. Factory rider Chaz Davies (GBR) achieved the set target, which was to start from the front two rows. The Welshman finished sixth in today’s turbulent Superpole qualifying with his BMW S 1000 RR, thus starting the ninth round of the 2013 FIM Superbike World Championship from the second row. His team-mate Marco Melandri (ITA) was denied of his chance to attack in the Superpole qualifying by a mechanical issue and will start tomorrow’s races from 15th on the grid. The day began according to plan with the team continuing the preparation work in this morning’s second qualifying practice. But during the free practice session in the early afternoon, luck changed for the squad. Chaz was forced back to the garage with a mechanical issue and lost a lot of track time. Marco crashed and had to be taken to the medical centre but fortunately he suffered only minor injuries and was ready to start in the following Superpole qualifying. However, Marco was only able to do one flying lap before he had to stop beside the track because of a mechanical issue. Consequently, Superpole was over for him and he had to settle with 15th. Chaz meanwhile did two outings in the first part of the session. For the second one he used qualifying tyres and set the best time to progress to the next session. He made it through Superpole 2 into the final and deciding third session by using his other qualifying tyre. In Superpole 3, Chaz tried to do his best on race tyres, when the session was red flagged as it started to rain in parts of the track. The modus was changed to a “wet Superpole” of 20 minutes for those nine riders who had qualified for Superpole 3. Conditions were changing during this session and track action was quite reduced, but towards the end the track dried again and with three minutes to go, the riders went out again to battle a final showdown for the grid positions with Chaz putting in the sixth fastest time. In the FIM Superstock 1000 Cup, Sylvain Barrier from the BMW Motorrad GoldBet STK Team secured his fifth pole position of the season in a dominant manner. The Frenchman broke the lap record by over seven tenths with his BMW HP4. His team-mate Greg Gildenhuys (RSA) qualified 20th. “We have reached the target of starting from the first two rows which is good but it was sort of a strange day. I have to admit that I was not totally happy with the bike in Superpole, it was a bit hard to ride. For one lap, when you try to squeeze out everything, it is a bit tough going but over race distance we did not seem to be too bad this morning. I have been reasonably happy with that but we still have to improve as the bike is struggling over the bumps. So we will work on that tonight and get it right for tomorrow. In the races we will be pushing for the podium. For sure it will be interesting because some guys have a good pace but I am not sure how sustainable that is over race distance here. “It was a difficult day. This morning I crashed quite heavily and hit the ground with my right hand and elbow. Now I have some pain in the fingers and I cannot bend my elbow properly. For this reason I cannot quickly release the brake and open the throttle. In Superpole, I did my best. I bit the bullet but then I had a mechanical issue on the second lap and in the end I could not take part in the qualifying session. The bike still struggles with the bumps but we are working on it. Serafino Foti (Sport Director BMW Motorrad GoldBet SBK Team): “It was not a good day. On this track we struggle with the bumpy surface and we also had some bad luck. Marco, after this morning’s crash, tried to take part in Superpole despite the pain but then could only do one lap due to a mechanical issue. We still have some work to do to make the bike ready for the race as we were not able to complete our job. In addition, Marco probably will have some pain tomorrow but I’m sure he will do his best to limit the damage and to get the best result he can. Chaz is quite satisfied, he feels a little more comfortable than Marco on this track and over the day he was able to improve his performance. He is on good form for tomorrow. In the warm-up we will work further on improving our performance. “Today we experienced the tough side of racing. Unfortunately we had some issues with both riders. Chaz had a mechanical issue during the free practice so he could not ride through all the session. Marco also had an unlucky free practice. He crashed and for sure he was not in the best shape for Superpole but then unfortunately he could not ride due to another issue. Overall I must say that Chaz managed to qualify on the second row which is a good position considering all the adversities we have had and the good point is that he was able to improve the feeling with the bike. He is still not 100 percent comfortable with the bike’s behaviour as he experiences some vibrations but we have another chance tomorrow during the warm-up where we are going to test something else in order to allow him to fight at the front. Also Marco has improved his feeling for the bike, the rear end is better than yesterday and this was proven by the fact that he was doing faster lap times. Also the rhythm is not too bad. But it will be very important to understand what his condition will be tomorrow and starting from the fifth row does not help but he has shown us in the past that he is able to make a very good start and tomorrow he will need one of his best.